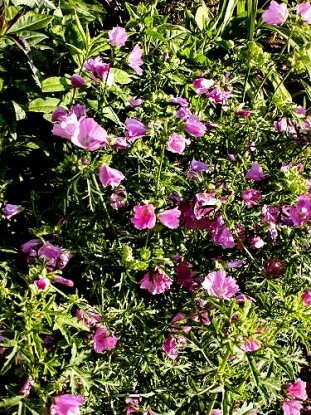 Malva Moschata is a well known and common perennial. While it is popular in the flower garden, did you also know that it is edible? The leaves are a good addition to salad. They are mild tasting and have more vitamin A than spinach! The seeds are edible, as are the pods and the flowers. 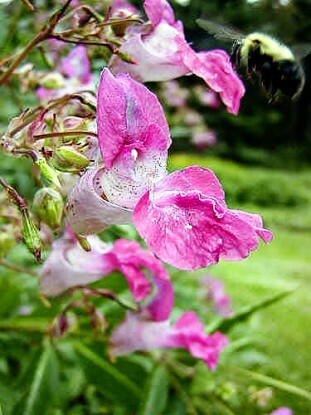 Many people grow this in their flower gardens as it is so beautiful and blooms all summer long. It can be slightly invasive and reseeds generously. It sometimes grows wild in the fields, having escaped from a nearby garden. 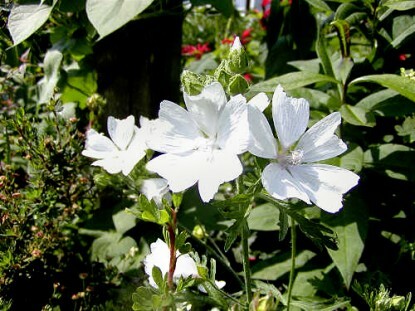 It is an easy to grow perennial, doing well in sun or partial shade and needs a lot of water. 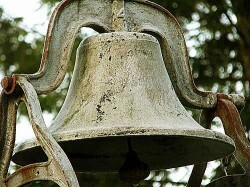 It also comes in white for your moon garden. Another flowering plant that can be brought into the kitchen is the garden jewelweed, impatiens Glandulifera. 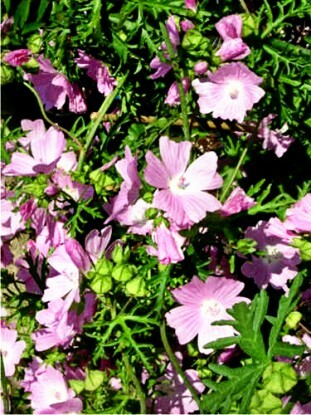 Like the malva moschata above, the flowers and seeds are edible. The flowers can be used to make wine or jelly and the seeds, when dried, taste much like walnuts. Use them in baking in place of nuts or sprinkled on a sundae. 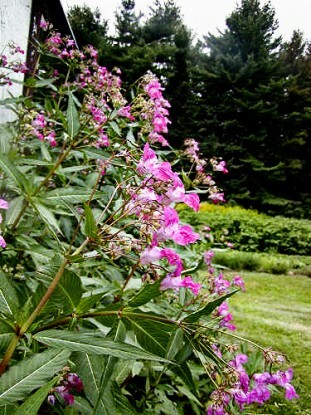 The pink garden jewelweed grows to be 6-8 feet tall and blooms all summer long! Its a beautiful annual. Once you have it, you always have it, as it reseeds generously! It has “touch-me-not” seed pods, like it’s cousin, the wild impatiens Capensis. When the wind blows, a bee lands or it gets shaken, the seed pods burst and spray the seeds everywhere. You have to close your entire hand over the group of seed pods to catch them as they burst. Be careful, it’s a bee magnet. Mine are always full of the big, yellow fuzzy bumblebees. It does well in shade and likes wet feet. 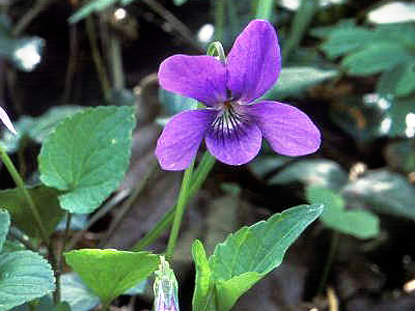 Violets are another plant that can be used in the kitchen. Violet jelly is a nice purple colour when made with purple violets. 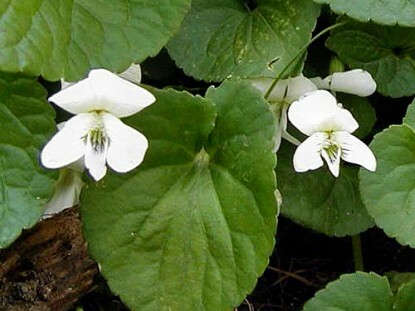 I grow the purple violets, white ones and yellow ones. The leaves are mild tasting, good in salad and high in vitamin C.
The flowers are edible and can be sugared for cake decorating! Also in white for your moon garden! Do you know whether garden jewelweed contains the medicinal components of the capensis variety? I had a thriving patch of capensis by the creek at my old place but am having no luck getting it started here. I have wondered that myself. I just don’t know. If you find out, please let me know too. I have managed to get some capensis seeds that I am going to plant this year.